Thanks for your visit! I welcome you and welcome you with such gratitude the gifts you have come to introduce me: the Christmas tree and the nativity scene, already set up in St. Peter's Square and which will be admired by many pilgrims from all over the world. I address my cordial greetings to each of you, beginning with the Patriarch of Venice and the Bishop of Concordia-Pordenone, whom I thank for their fraternal words. A deferential greeting I address to the civil authorities, and I extend my affectionate thought to all the inhabitants of Jesolo, Pordenone, Veneto and Friuli-Venezia Giulia, whom you represent here. I thank all those who cooperated for the realization of these Christmas signs, especially the four sculptors, from different countries, who carved the crib, and the technicians and staff of the Governorate. The tree and the crib are two signs that never cease to fascinate us; they tell us about Christmas and help us to contemplate the mystery of God made man to be close to each one of us. The Christmas tree with its lights reminds us that Jesus is the light of the world, it is the light of the soul that drives away the darkness of enmities and makes room for forgiveness. The spruce that this year is placed in Piazza San Pietro, coming from the Cansiglio forest, suggests further reflection. It, with its height of over twenty meters, symbolizes God that with the birth of his Son Jesus has lowered himself up to man to raise him to himself and raise him from the fogs of selfishness and sin. The Son of God assumes the human condition to draw it to himself and to make her participate in his divine and incorruptible nature. 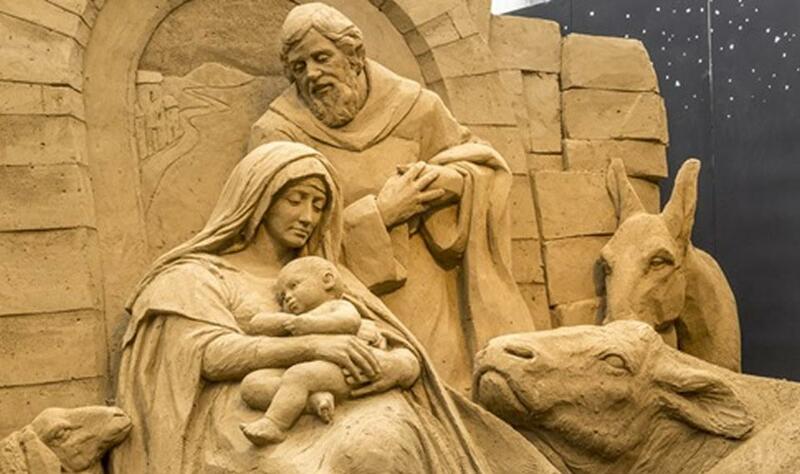 The crib, located in the center of the Piazza, is made with sand jesolana, originally from the Dolomites. Sand, poor material, recalls simplicity, smallness and also fragility - as the Patriarch said - with which God showed himself with the birth of Jesus in the precariousness of Bethlehem. It may seem that this smallness contradicts divinity, so much so that someone from the beginning has considered it only an appearance, a lining. But no, because smallness is freedom. Those who are small - in the evangelical sense - are not only light, but also free from any desire to appear and any claim to success; like children who express themselves and move spontaneously. All of us are called to be free before God, to have the freedom of a child before his father. The Child Jesus, Son of God and our Savior, who we place in the manger, is Saint in poverty, smallness, simplicity, humility. The crib and the tree, fascinating symbols of Christmas, can bring in families and meeting places a reflection of the light and tenderness of God, to help everyone to live the feast of the birth of Jesus. Contemplating the Child God who emanates light in the humility of the nativity scene, we can also become witnesses of humility, tenderness and goodness. Dear friends, I renew my gratitude to all of you and offer you the best wishes for a Merry Christmas. A good and holy Christmas! I ask you to pray for me and I cordially bless you, your family and your fellow citizens. Thank you.